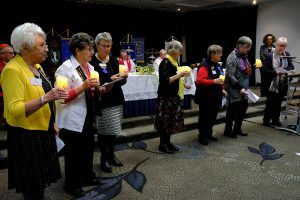 More than 100 representatives of the Catholic Women’s League Aotearoa New Zealand ‒ Te Roopu Wahine Katorika o Aotearoa convened in Kilbirnie, Wellington, 25‒28 July, for their national biennial conference. Delegates represented New Zealand’s six dioceses, with 35 members from the Wellington Archdiocese and 12 from Palmerston North Diocese. There was also a group visiting from Australia. 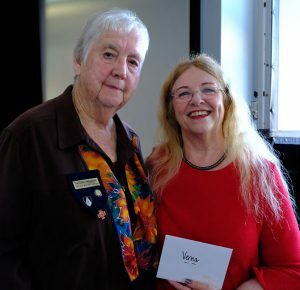 CWL National President Kay Blackburn with Pillars Chief Executive Verna McFelin. National President Kay Blackburn welcomed delegates and visitors including Cardinal John Dew, Fr John Morrison of Christchurch and Fr James Mulligan of Auckland who celebrated the opening Mass. Guests were also from ‘sister’ churches – the Salvation Army and Presbyterian Women Aotearoa NZ. In his homily Cardinal John connected CWL’s mission to Pope Francis’ recent document ‘Rejoice and be Glad’ about being Holy in the ordinary things in life and necessary attitudes and signs to understand the way of life called to us by the Lord: perseverance, patience and meekness; joy and a sense of humour; boldness and passion; being in community; being in constant prayer. After Mass Cardinal John was invited to officially open the conference. The conference theme ‒ and CWL’s focus for the next two years ‒ was ‘Women Welcoming Change’. In her welcoming address Kay Blackburn quoted Joan Chittister (US Benedictine sister and prominent advocate of justice, peace and equality): ‘We don’t change as we get older, we just get to be more of what we have always been. Kay added: ‘We need to take more of what we have always been and apply it generously to everything we do’. Anne Dickinson from the Archbishop of Wellington’s office, delivered the keynote address. Anne drew on Luke’s Gospel about Mary and discernment. Anne explored how to reach out to actively look for those in need in a way that respects their dignity. She described in depth how to effect change through the individual process of self-knowledge with God and working through desire, discernment, decision and action. Other speakers and topics included social issues, people trafficking in New Zealand and motor-neurone disease. Branch presidents of the six dioceses at the opening Mass. Later in the week, a special celebration was given in honour of Sr John Bosco Kendall rsj who has been involved with CWL since 1958, including the last seven years as Chaplain to the National Board. Another highlight was an afternoon tour of the Our Lady’s Home of Compassion, Island Bay. The Catholic Women’s League began in New Zealand in 1931 and is this country’s largest Catholic lay organisation.